I’ve been told that limitations can stimulate one’s creativity. With that in mind, I came up with a little assignment for the maniacs. The task: write an E-pistle around your tasting notes for a dozen different whiskies. The catch: Think of a ‘theme’ and a alliterative title along the lines of ‘A Dozen D* Drams’. This wasn’t occupational therapy, mind you – I felt we needed more tasting notes on MM. Oh, I thought I was so clever – until I decided to try and put together a tasting myself. Then I suddenly realised that it wasn’t so easy to match the recently added samples on my shelves to a specific ‘theme’ – especially if the name had to start with ‘D’. I finally settled on the fairly obvious ‘disposable drams’ (they were all small glass and plastic sample bottles, you see) and since I anticipated the arrival of a few hefty E-pistles at the end of this issue I’ve restricted myself to half a dozen samples this time. Hey, I make the rules so I can break ’em. I used to have my fair share of prejudices about blends – but that was about the cheap blends I drank in the late 1980’s. Nose: Sweet with some faint pickles in the background, growing dustier. After a few minutes clear notes of antiquity. Here’s a whisky that deserves some serious attention. Hints of diesel oil? Turpentine perhaps? Taste: Oy… Flat, sweetish and dusty with a hint of perfume. The taste seems oxidised or just seriously off. That being said, after some fifteen minutes some pleasant medicinal and antique notes emerged. Score: 82 points – the nose is remarkably complex for a blend, but the taste kept it from the 80’s for a long time. I’ve never really been a big fan of Glenturret, but maybe this oldie can change my opinion about the distillery? Nose: Wow! Quite an expressive nose. Well…. It expresses a lot of vagueness very loudly. Hint of Maggi? Taste: Bweurgh! Phew, this has certainly passed the point of no return. Like the Whyte and Mackay, but far worse. Harsh feeling. Again, it’s a combination of perfumed antiseptic stuff and dust. And here time doesn’t redeem it as in the W&M. Score: 48 points – I don’t know if time is the sole culprit here, but apparently oxidation completely ruined the palate for me. Something in the taste reminded my of my grandmother’s moth balls and old clothing cabinet. Oxidation seems to have had an effect on the W&M, but maybe not necessarily all bad. On the other hand, it pretty much ruined the Glenturret. The nose recuperated after a long time, but the taste never did. In the end I gave an overall score of 48 points to this oxidised miniature, but I’m quite sure it would have scored higher had it not been oxidised. So, I won’t submit that score to the monitor – fresh bottles and miniatures might be fine. I wasn’t that keen on Glengoyne in the 1990’s, but the new owners take much greater care with cask selection it seems. Nose: Light and very slightly oily at first, sweetening out. In fact, it becomes remarkably sweet. That puts it over 75. Taste: Not nearly as sweet as the nose at first, but it gets there. Mouth feel improves over time as well. Score: 77 points – Certainly not a bad dram, but it’s not quite ‘up there’ with the bottles from the 1990’s. I’ve tried a few old ‘dumpy’ Cadenhead’s bottlings at ‘Whiskycafe De Still’ I wasn’t crazy about, but they probably were ‘dead’. Nose: Whow… Quite unique. A combination of fruits, spices and organics I’ve never encountered before. Onions? Pickled herring? It sweetens out over time, growing more ‘introspective’. Never boring and quite a challenge. Taste: Yep, there’s antiquity for you. Leather. Hints of smoke & rubber? Excellent mouth feel at ‘only’ 46%. Score: 88 points – one of the finest Longmorns I ever tried. Lovely indeed, leaning towards 89 points in fact. And now for the ‘piece the resistance’ – my first ‘official’ Kininvie which came all the way from Taiwan. 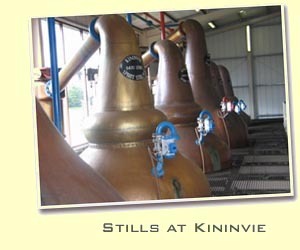 5) Kininvie 15yo 1990/2006 ‘Hazelwood 105’ (52.5%, OB, First fill sherry cask, Bottled August 1 2006) – from Ho-cheng. Needless to say, this is something very special – if I’m not mistaken the very first official bottling of Kininvie ever. Nose: Light & malty. Not too expressive, but clearly very well made. Perhaps a tad too sweet for some, but I like it. It remains light in character, but over time some heavier and more herbal notes appear (without growing ‘piney’). Sweetened oatmeal? Faint spices hop in and out of the picture. Very subtle fruits and flowery aroma’s. Whiff of plastic. Actually, this grows nicer and nicer as you give it more time. Even some excellent organics emerge after half an hour. Hey, in the end I even got a whiff of something medicinal. You have to work at this one, but it’s rewarding. Taste: Smooth and sweet. Although it comes from a sherry cask it feels a bit like a bourbon. Not a lot of wood notes. Some development over time on the palate – some fruity notes join the party; the sherry comes to the surface now. Score: 84 points – I had it at 83 for a very long time, but with the nose still going strong after half an hour it hopped to 84. Nose: Heavier than I expected. malty with a hint of oil and something metallic. Vaguely dusty like a heap of old barley. It grows a little ‘dirtier’over time – which is good. Spicier and nuttier and something reminding me of recent Deanstons. And again the metallic notes pop up. Opens up immediately after adding water. Dentistry aroma’s. Upper 80’s now. Hm… Not much change there. The nose lifts it to the upper 80’s but the palate keeps it at a relatively modest 85. So, the winner of this set was the Longmorn from Cadenhead’s – and quite convincingly, I might add. In fact, Longmorn is a solid, reliable distillery that’s perhaps just a smidgen too soft-spoken to make it into my Top 10. However, if I try a few more expressions like these it just might make the jump one day… I’ve always ‘liked’ Longmorn because of the affordable and rather good 15yo OB – maybe I’ll learn to ‘love’ Longmorn in due time. I already have a soft spot for Longmorn because it was the first bottle I shared with a fellow malt maniac in 1998 – it was a Longmorn 1963 brought to Amsterdam by Craig Daniels.